4.00 am. My alarm goes off. It’s cold in my room and I feel terrible. I’m tired. Really, deeply tired and maybe a bit sick too. I flex my ankles and then my calves – everything feels tight and sore. I haul myself into a sitting position on the edge of the bed and take a drink, along with a couple of pain-killers and a vitamin tablet. I’ve already ridden 550 km and 10,000 meters of ascent in the last few days, but there’s a bigger problem still ahead, for in three hours time I’m going to attempt to ride the entire route of La Doyenne: the original and Queen of the Classics – Liege-Bastogne-Liege, 276 km and 4,640 m of ascent. I stand up slowly, wince and pray the pain-killers kick in fast. 6.30 am. We roll away from the start line in Liege: me, a friend (Pitsi) and 800 other riders. It’s still dark, so navigating the city’s roads and cobbled sections is easier said than done, but it’s the pro race tomorrow and their direction arrows show up clearly enough. Almost immediately, the road starts climbing and although it flattens from time to time, it barely seems to go down at all in the first three hours. Grey becomes green and we head south into the beautiful Ardennes hills. Dark forests, small villages and narrow ribbons of tarmac, snaking into the distance. 9.00 am. The route splits: left for the shorter (155km) version, or straight on for the full monty. We go straight on. 9.30 am. Dochamps and a wave from Mrs Deeker! I’m still feeling awful and so many people seem to have overtaken me. I can’t really be this slow can I? I glance down and finally spot the temperature on my Garmin: 1.2 degrees centigrade. Well that might explain things. I cling to the hope that if I just keep spinning, eating and drinking, things might improve. It’s tenuous. Somewhere on the climb out of La Roche-en-Ardenne, I lose Pitsi. The plan had always been that we would try to stick together until Bastogne, but that’s pretty close now, so I keep my head down. 10.30 am. Bastogne. The half-way turning point that isn’t even close to half-way. I’m on my own now. Cyclists everywhere, but I don’t know a soul. And this is the first real milestone: turning back north. And straight into a really stiff headwind. I find a likely bunch in which to hide and bide my time. 11.00 am. Bizarrely, four and a half hours in and I’m beginning to feel better. The roads roll incessantly and the wind is ever present, but I’m finding some rhythm at last. The Cote de Saint-Roch (1.0 km, 22.5% max, 12% av) gives a stark warning of what’s to come, but suddenly no one’s coming past me anymore and I feel slightly more confident. It’s warmer too – almost 5 degrees now! 12.30 pm. Vielsalm. I’m 165 km in and somehow, against all the odds and all logic, I’m feeling OK. Normally this sort of distance would signal the end of a long ride, but today discards all reference points. 12.40 pm. And now the real work starts: 10 legendary climbs, spread pretty evenly over the next 115 km. It would be a tough outing even starting fresh from here, but with six hours already in my legs, plus the previous week of punishment, I’m amazed I can still ride a bike at all. 12.45 pm. The Cote de Wanne (2.6 km, 15% max, 7% av), feels slow: it’s open and I’m really catching the wind. But the evil, steep, Cote de Stockeu (1.0 km, 24% max, 13% av) feels faster, bizarrely. Brutal cobbles and the horrible Cote de Haute Levee (3.9 km, 20.5% max, 5% av). 2.00 pm. I’ve promised myself a gel after every three climbs and it seems to be working. Keep spinning. No one’s passed me since the hard climbs began. I’m slowly winding things up and really trying hard. 3.00 pm. Sunshine and the beautiful, alpine-esque Cote de Rosier (3.9 km, 12% max, 6% av). The Col du Maquisard , steep, twisty, dark forests (2.4 km, 11% max, 6% av). A photographer snaps me in my Molteni jersey. The Rules say my rainbow bands are in poor taste, but I’m paying homage and I think Eddy would be OK with it. Mont Theux, two climbs in one, straight, steep and too many cars (1.1 km, 18% max, 9% av). 3.45 pm. Under the motorway and a place of legends reveals itself: the properly steep Cote de la Redoute (1.6 km, 25% max, 9% av). Another gel, drink again. Keep going. This is where the pros often attack, so I try to dig deeper. Big, fast descents reveal just how high the climbs are. The Cote du Hornay (1.1 km, 12% max, 6% av) and then the double climb of Cote de Colonster (2.9 km, 10% max, 6% av). Into Seraing: it’s fair to assume the Liege tourist board didn’t pick the route. Except, bizarrely, they did! Green becomes grey, hills become factories and fields become urban grime. It reminds me of scenes from Mordor, but it’s also what makes this race so special. 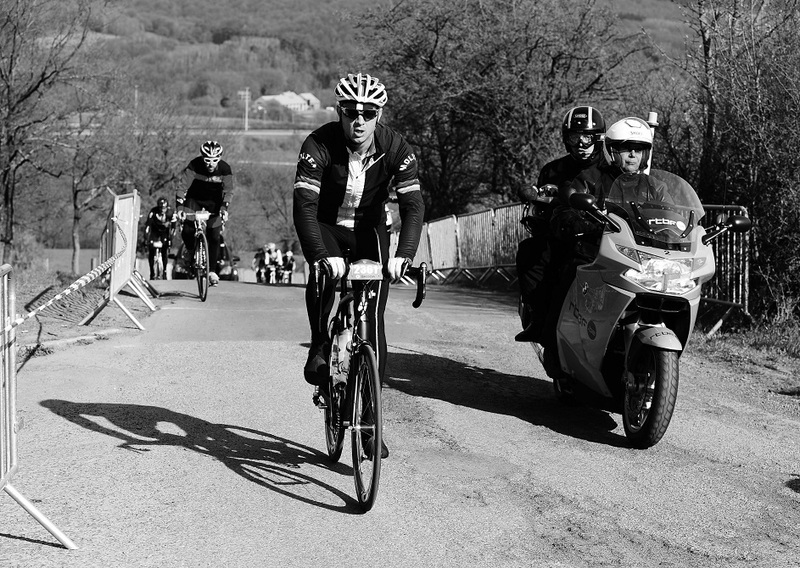 The transition back to Liege and the feeling that the finish is finally within reach. 5.45 pm: Emptying whatever’s left in the tank, which isn’t much. The Cote Saint Nicolas (1.1 km, 20% max, 9% av) – a street climb like no other. It really hurts. 6.09 pm: I almost clip a curb in my dash for the final drag to the finishing line in Ans, which is so much steeper and longer than it looks on TV. And then I’m there, across the line and done. Really, really, completely done [in]. La Doyenne. It really was. 276 km, 4,800 m, 11 hours and 39 minutes and without a doubt the hardest day I’ve ever spent on a bike.